You’ll never run out of things to do in the City Different, but sometimes it’s good to get out and explore, especially with all that the Land of Enchantment has to offer its guests. There are plenty of excellent day trips from Santa Fe that provide guests with one-of-a-kind experiences that will make you want to come back again and again! If you want to make the most of your trip to our unique city, request our free Vacation Guide! If you love the art and history of Santa Fe, you need to take a day trip to Taos. This longtime artist colony lies at the foot of the Sangre de Cristo Mountains and boasts some of the top sights in Northern New Mexico. The Taos Pueblo is an architectural marvel and one of the most, if not the most, impressive adobe building in the entire American Southwest. San Francisco de Asis Church is another beautiful display of adobe architecture in the area. Historic Taos Plaza is a lovely spot to take a stroll through town, and modern marvels such as the Rio Grande Gorge Bridge and the Earthship Biotecture provide a look into the future of the Land of Enchantment. Bandelier National Monument the perfect short day trip from Santa Fe. It’s only a 50-minute drive and features some of the oldest remains of adobe architecture in America. You can go for a fantastic hike around the canyons and gullies where you’ll find awe-inspiring homes carved into the sides of cliffs around the park. After (or before) your trip to Bandelier National Monument, stop in Los Alamos. At first glance, this sleepy mountain town isn’t much, but if you do a little research, you’ll find that this is home to Los Alamos National Laboratory, which was the birthplace of the atomic bomb in World War II. You can’t visit the laboratory, but you can take a tour of the Bradbury Science Museum and the Manhattan Project National Historical Park for insight into one of the most profound and dark discoveries in human history. The Turquoise Trail is a great day trip from Santa Fe to Albuquerque, especially if you fly in and out of Albuquerque Sunport. There are three fantastic small town stops along the way that each have their own unique feel. The Sandia Peak tram overlooking New Mexico’s largest city provides excellent views. Science fiction fans will appreciate this iconic network of radio astronomy satellite dishes in the New Mexico desert. The National Radio Astronomy Observatory, also known as the Very Large Array for its miles of railroad track transport in a Y shape, is about a three-hour drive south from Santa Fe and provides tours every month for visitors interested in this fascinating network. Out of all of the natural wonders in New Mexico, White Sands National Monument tops the list. This breathtaking park showcases miles of dramatic bright white sand dunes where you can hike, sled, and explore all day long! It’s about a four-hour day trip from Santa Fe so get an early morning head start to maximize your time in this mesmerizing landscape. Book Your Santa Fe Getaway Today! 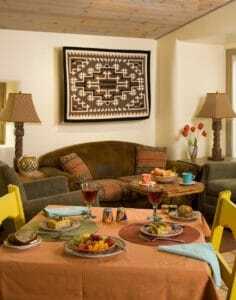 Return to your comfortable room at Four Kachinas after a long day trip from Santa Fe. Each of our authentically decorated accommodations features gracious amenitites and beautiful interiors, providing you with an unmatched stay in our one-of-a-kind city. Wake up to a delicious breakfast every morning before walking out of your door into the heart of Santa Fe! Start planning your trip to the City Different and book one of our rooms today! We look forward to welcoming you to Four Kachinas!